She started dancing at an early age and won her first medal (gold) at the age of five, 1 st place in the Slip Jig in the Mansion House Dublin. She danced in an embroidered white costume with a big white bow in her hair, having travelled 20 miles to get there (no mean feat in those days) in a car that was driven by a local lady, Rita Hughes. Between the visits of Peg Meddlar, her dance teacher, to the local school, the schoolmaster Mr Harrington would ask her to give dance lessons to the other children. Peggy was a diligent student; she won a first prize for Domestic Science and a Gold Fainne (Fawn- Ya) for Gaelic Speaking. She won the Kildare Irish Dancing Championship for 3 years. When Peggy graduated, she taught Irish Dancing to· the children of the local well to do to in their homes, she would also cycle for miles to the local towns and villages to teach Irish dancing. She left Kildare for Scotland at the age of21 in 1935 it was as a qualified teacher, number 12 on the list and became the first TCRG outside of Ireland. great demand to give exhibitions at these events. It was at a ceili in 1936 where she danced the Blackbird that she met a Glasgow born prize winning Irish Tenor called Frank O'Neill. They were both asked to perform the following week at a concert given by Fianna Fail and that began their career of them singing and dancing together. Fr. McSparrow married them on the 6th July 1938 in St. John's Catholic Church in Portugal St., Glasgow. They had two children, a son born in their home in Eglington Street on the 21 st September 1940 and named Francis after his father. A daughter born on 4th June 1942 named Margaret after her mother, and with a middle name of Laureen taken from a poem by Allen Ford that was published in Irelands Own the week before she was born. In the intervening year between the children being born, Peggy won the Scottish Senior Irish Dancing Championship an accomplishment that was emulated for the first time 20 years later by Daughter Laureen and for a second time in 1964.
featured in was "The Black Diamonds" with Mutrie Kelsol. Frank was Chairman of the Anti-Partition League in Glasgow. Peggy first started teaching dancing in Glasgow in 1937 for Fianna Fail in Old Rutherglen Road and was among the delegates who met Eamon Dev Velera at the convention in Glasgow. In 1948, the O'Neill School of Irish Dancing was formed in Bishop Street in Anderson, Glasgow, it later moved to the AOH Hall in Errol Street, in Glasgow's Gorbals area. When Peggy Started out on her own she was in great demand from the local clergy to teach dancing in their parishes, among them was Fr. Walsh in St Cuthbert's in Burnbank, Fr. Healy in Pollokshaws and Fr Duddy in Calderbank. There was also a class in Paisley, these classes were all evening classes and the pupils wore a different school costume from the regular Sunday class. This fact was to have a major impact on the future developments of competition entries. expenses paid trip to Dublin at Easter to compete in Fr Mathew Feis. Ireland Championship. Peggy established a feis in Glasgow in 1953 to commemorate the Marian Year. Zealand was also a student when she visited Glasgow in the early 50's. To show case her dancers and give them experience of demonstrating to a large audience, Peggy and Husband Frank started a series of celebrity concerts in the West of Scotland many of them for charities. The dancers were also to appear on TV and on several theatre productions. period of her absence, her senior dancers showed a remarkable level of loyalty and did a wonderful job of keeping the class of over 100 pupils "on their toes". Among the achievements of the pupils of the O'Neill School in 1960 the adult Dancers were runners-up in the World Folk Dancing Championship at the Edinburgh Festival. The adult team also won the Scottish and British Championship's and first at the All Ireland in 1963, (the first non-Irish team to do so). The dominance at the Glasgow Feis was such, that during the period 1949 until Peggy left for the USA in 1964 that the adult solo Scottish Championship was won by school pupils a total of 12 times out of a possible 16.
dancers, and allowed them to wear a particular style of costume but in their own choice of colour. That had the desired effect, and it probable that action was the foundation for the array of individual solo costumes the can be seen at any Feisanna today. When Peggy left for the USA in 1964 with daughter Laureen, she left behind a thriving class of over 100 pupils in the capable hands of a former pupil, Patricia McTominnie TCRG. A former, two times Scottish Adult Champion. Many of Peggy's former pupils in the UK have qualified TRCG and ADCRG. Among them Ann (McGovern) McHugh, Patricia (McTominnie) Brady, Myrna (McLaughlin) Kennedy, Mary (McCann) Roarty, Frances (Teece) McHaffie, James McLaughlin, Vonla Coyle, Frances Keenan, Grace (McNulty) Hughes, Geraldine (Frair) MacKay, Bridie McLaughlin, Suzanne & Margaret Dailly, Margaret Murtagh, Mary Lindsay, Elsie Munro. Peggy was a dedicated teacher who had a thirst for knowledge and to pass that on to her pupils. When pupil, Ann (McGovern) McHugh took her TRCG exam, she knew by hart every ceili dance in the book and 34 set dances. Peggy's daughter Laureen was the Adult Senior Scottish Champion and a qualified TCRG when they departed for the USA in 1964. Glasgow Feis chairman Fred Sweeney wrote in 1989 "Peggy O'Neill's contribution to Irish dancing in Scotland shall never be forgotten as it was the most outstanding of all time". When Peggy arrived in the USA in October 1964, she was the first qualified adjudicator in the USA. It was indeed to a brave new world and it took a lot of courage for the family to uproot from a comfortable ordered life in Glasgow. Initially Peggy was very unsettled by the change of environment, she was disturbed at the difference in the way Mass was celebrated; she felt she had not received the sacrament and that was a major concern to her. Also, the routine of her life had. altered, no dancing class to go to. But all of that was to change when her husband Frank made enquiries in the local Irish Club and only Irish Bar in the area about starting a dancing class. At first, she was surprised at the diverse background of her pupils; it was a daunting task to teach students who had never seen Irish dancing before. Often she would morn the loss of her accomplished dancers in Glasgow. But with continued hard work and dedication to the task she loved, gradually her dancing class started to shape up. Before long, she was organizing ceili' s for her students to enjoy. her praise on the cover of their record album. Terence Winch in his article in the magazine Washingtonian in March 2000 called her "Grande Dame of Irish Dance in DC" he also said" O'Neill brought a worldwide reputation as an Irish-dance teacher to Washington, with her aura alone lending authority to DC's evolving place in Irish-American cultural life. Her endearing veneer belied a will as tough as that of a strict parish pastor". In 1965 when son Frankie, who was a member of the team that won first in the All Ireland competition, and Scottish & British Championships, came to States for his sisters wedding she insisted he bring his dancing costume, she entered him in Feis in New York and he won first prize in both solo competitions entered. Peggy was in constant demand for her services and husband Frank would accompany her to venues far and near and in 1971 both Frank & Peggy became u.s. Citizens. In 1972, her dancers were asked to perform in the White House for President Regan. Ambassador Wornock presented her with an Irish Flag and a statuette of CuCuhulainn for services to Irish Culture and in Chicago, when the very first examination of adjudicators in the USA took place; Peggy was the North American representative on the panel. of that year when husband Frank died (age 62) after surgery. Frank was a Fourth Degree Knight ofSt Columba and President of The Emerald Isle Division of the Ancient Order of Hibernians at that time. Both of these organisations formed an honour guard at his funeral. 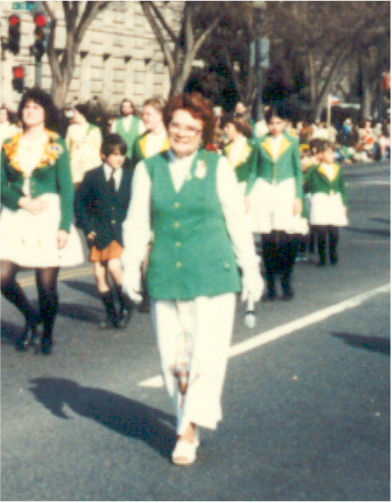 Peggy and her dancers participated in the St Patrick's Day Parade every year and Peggy would there leading them. In 1978, she was made the first lady Gael of the Year and had her own special place in that St. Patrick's Day Parade in an open top car at the head of the parade. In November 1979, Peggy was honoured by the Dance Teachers of North America and presented with a plaque for the services to Irish Dancing. The following Monday Peggy had surgery, a radical Mastectomy, but within a short time she was back teaching Irish Dancing. In 1983, Peggy's dancers won the Presidents Award and The O'Neill-James Trophy at the Washington DC Feis. Peggy and Daughter Laureen traveled together to Dublin where Peggy adjudicated at the World Championships in the Mansion House. It was a fitting and triumphant return, for the last time, to the venue where her dancers in 1963 were the first non Irish team to win in the All Ireland, and where she won her own first medal, 62 years before. Peggy remained very active her name is recorded in the book of lrish American Who's Who, but in 1984, Peggy was admitted to hospital and died (aged 69)-at 2.30 am on the is" October with her son and daughter by her side. Her dancing class at the time of her death numbered over 100 pupils, many of them attended her funeral in dancing costume, and there were representatives from the Irish Embassy and from the Irish Dance Teachers Association. Pupils of Peggy in the USA who have qualified to teach Irish Dancing, Bridget Carroll, Sean Culkin, Maureen Donnellan, Caterina Gori-Earle, Laureen O'Neill James, Margaret Cleary, Anne McBride. In her obituary from the Gaelic League of Washington DC, they said she was "known to Washington's Irish-American community as a superb and indefatigable teacher of traditional Irish dance". Frank & Peggy O'Neill were posthumously inducted into the Irish Cultural Hall of Fame in 1989 among the testimonies in support of their application was one from Padraic MacKernan, Irish Ambassador to Washington DC.